Loads on marine offshore structures are largely determined by the detail of wave structure interactions in random sea states. FLOW-3D allows users to model non-linear interactions between floating structures under a variety of wave types and sea spectra, including JONSWAP, Pierson Moskowitz, and custom wave energy profiles. FLOW-3D provides green water (water on deck) presence analysis, impact loads, and fully non-linear wave propagation analysis, as well and structure response in wave – structure – mooring systems. 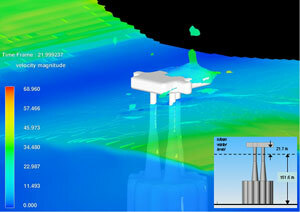 In addition to fixed pile structures, FLOW-3D can be used to simulate the forces on floating structures, such as the dock shown here. The movement of the dock is stabilized using the mooring lines model, and the dynamics of the dock as a result of a steadily increasing water level can be seen in this video. The calm-water air gap under offshore platform decks is a critical design parameter and is determined by the required minimum air gap in extreme design conditions. FLOW-3D can be used to effectively in the prediction of air gap and wave impact loads on offshore platforms, tension leg platforms and semi-submersibles. By modeling problems at full scale in the numerical environment, FLOW-3D allows engineers to by-pass the often delicate scaling issues associated with reduced-scale model physical basin testing.